How to quicklist for DeaDBeeF? There are a few other commands in deadbeef -h but these are the only ones that I thought made sense to add. Not the answer you're looking for? Browse other questions tagged 11.04 unity quicklists or ask your own question. What Custom Launchers and Unity Quicklists are available? How do I add a static quicklist for Opera to open new tabs and windows? How to add a bookmark to the Home Folder icon in Unity? How do I make a quicklist for umplayer? How to edit quicklist for a Mounted Device in the launcher? How to add checkbox or radio buttons to a Unity quicklist? 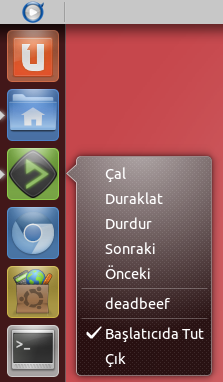 How can i edit the nautilus quicklist in ubuntu 13.10? How to restore re-created default user directories to Files quicklist?